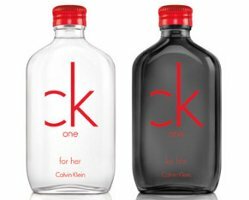 CK One Red Edition for him ~ with pear, aldehydes, suede, black pepper, ginger, vetiver, tonka bean and musk. Calvin Klein CK One Red Edition for her and for him will be available in 50 and 100 ml Eau de Toilette. Yeyy. An Nth flanker with similar notes to all the previous 20 years ones. I don’t think I can survive the wait time to see these at discount shops. True! But I am more offended that they’ve genderized them. So it should be CK Two, not CK One. Coty’s really milking this particular cow dry, aren’t they? I agree with Robin…silly to assign a gender to them – especially considering the ‘shared’ theme of the original. That said, if you take away the pear from the men’s version, the remaining notes don’t appear to be all that bad. Sure, it’ll vanish in an instant but it might be an interesting 60 seconds! They need to…don’t think they’ve had a hit from CK in a long time. Although no idea how Downtown is selling. Coming soon for 70% off at Marshall’s TJMaxx Burlington Coat Factory. They gendered the CK Shock versions from last year (two years ago?) as well. I agree, it misses the point of the whole CK One concept entirely. And just looked at the comments, apparently it did not bother me one bit! Didn’t even notice.